The Portuguese from the San Joaquin Valley took an early liking to Pismo Beach and came in such numbers that the city was nicknamed ‘the Portuguese Palm Springs’. Bringing their traditions with them, they soon began to lay the foundation for one of their most celebrated festas, The Feast of St. Anthony of Padua, native of the Lisbon, Portugal. 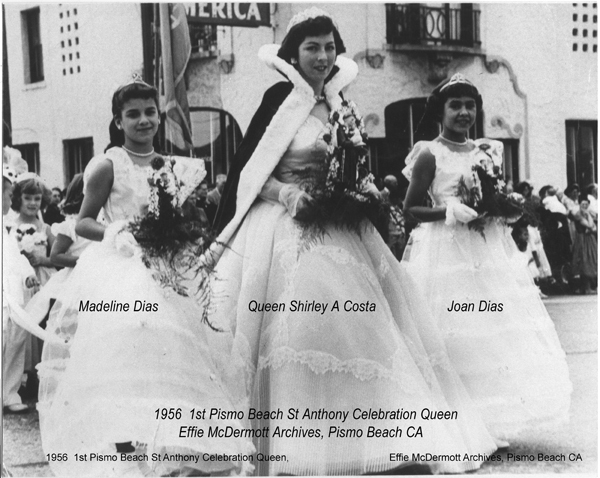 The first St. Anthony celebration in Pismo Beach was in 1956. The Pismo Beach Brotherhood of St. Anthony, Council No. 39, formed under the leadership of president Frank Lopes and was made up of members of the Portuguese community from Pismo Beach and numerous towns in the San Joaquin Valley. In 1958, the group incorporated as the ‘St. Anthony Celebration of Pismo Beach’. Before the festa grounds on Bello Street were acquired, sopas was served at the Lion’s Club on Addie Street. Each year the procession begins near the beach and walks through the streets of downtown Pismo Beach, on Sunday morning, to St. Paul the Apostle church on Bello Street. Following mass at the church, everyone is invited to the St. Anthony grounds for sopas. The procession leaves the church and continues in formation south along Bello Street to the festa grounds at the end of Bello Street near the creek. Sopas is the traditional dish of the Feast of St. Anthony. It is a stew of beef and cabbage served in large family style bowls with large hunks of bread. It is a hearty meal, and so delicious! and well worth the experience. The donation for the meal is reasonable. At the end of the event, if any is left over, it is available as takeout. Prices are reasonable. Best bring your own large covered takeout bowl and take some home to enjoy later. The tradition of feeding all who are hungry commemorates the feeding of the hungry by Queen Isabel of Portugal who provided food to her people in times of need in the 14th century. She is said to have left her crown on the altar of a procession, giving thanks to the Holy Ghost for intervening to save her people. Azoreans commemorate her charity by carrying her eight-sided crown aloft in their annual procession. In another version of the tradition, she is said to have placed her crown on a peasant girl, which is the basis of the tradition of girls from each community being selected to be queens of the festivities. The president of the council now customarily selects the queen. If you are fortunate enough to witness the procession, you will see these amazing beautiful dresses, crowns, and capes of each queen and her court. Three types of festas are practiced in Portuguese communities and the cape of each queen represents the type of festa her community embraces. Some capes cost many thousands of dollars to make and are works of art that are passed down as treasures within the family. St. Anthony festa capes will be adorned with images of St. Anthony, lilies or the baby Jesus, and in colors associated with Franciscan robes such as peach, tan or brown. The Our Lady festa cape is in honor of Our Lady of Fatima and will likely be blue to represent the heavens from which Our Lady of Fatima appeared, and will have images of the Blessed Mother. The Pentecost or I.D.E.S. festa cape will have symbols that represent the Holy Spirit or Queen Isabel, most being red or white and having doves, roses or the crown of the Holy Spirit. This is from the tradition that Queen Isabel had a mean husband who wanted to starve the people. When he caught her taking food under her cape to the people, the contents under her cape miraculously turned into roses, although it was in the cold of winter. I.D.E.S stands for Irmandade do Divino Espirito Santo, Brotherhood of the Divine Holy Spirit. Each queen is accompanied by her court, council officials, and in many cases a marching band. The outgoing queen leads the procession, followed by dozens of visiting queens. The new Pismo Beach queen and her court conclude the procession. The following year this queen and her attendants will lead the Pismo Beach procession, as the next new queen and court follow in last position. The queen may be crowned at a ceremony the night before, or she may be crowned during the procession. In the latter case, as the procession approaches the church, the visiting queens stand aside and leave an aisle down the middle of the street for the new queen and her court to pass through. The past queen surrenders the crown, and the priest crowns the new queen at the church. Vats of sopas are cooked at the festa grounds, at 390 Bello Street, to feed the participants of the parade and all who wish to join in the feast. In addition to the procession on Sunday morning and the sopas dinner Sunday afternoon, that are open to public enjoyment, the organization also holds dancing and ceremonies throughout the weekend and continues into Monday. Auctions and fundraising activities accompany the dinner, in order to help continue the tradition for another year. Raffle bidding and donations can be made at the sopas. In the San Joaquin Valley, some festas also have bloodless bullfights, which have all the pomp and excitement of bull fighting, but merely humiliate the bull by tagging him with Velcro©-tipped spears that stick to a Velcro collar, — invented by the Portuguese for this sport.